On a positive note, these are bright and loud bags that are highly visible on the shelves. The logo is prominent and the colors are commanding. However, Louisiana is home to some of America's most innovative, original and flamboyant art. You would have thought Zapp's could have come up with someone that could at least match the flavor names with great packaging designs. . These Chips had the usual firm crunch of a Kettle Cooked Chip, but the many vesicles broke that rigidity up to formulate a neat mix of regular and Kettle Cooked Chip munching. They did not melt in mouths like regular Chips though. These were really clean and healthy looking Chips. There were not nearly as many irregularly shaped Chips in the bag as with some Kettle Cooked varieties, but there was a consistent spread of oil bubbles of a similar height on the surface of the Chips which suggested they were cooked at a lower temperature for longer. There was also some brown edging that was probably potato skin. A Nose Plunge Test revealed a tart vinegar aroma, which is just about right. 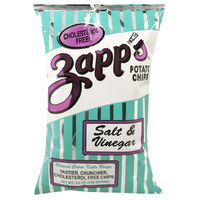 As Zapp's seem to really go for it with their flavors we feared the worst. We are sticklers at Chips & Crisps for an accurate flavor description, and there is a reason this flavor - just the second flavored Chip variety ever to hit the shelves (invented in the UK in the 1950s), has two main ingredients: They balance each other out to bring home a great flavor combo. Our concerns were unfounded. There was a good balance between a strong vinegar and equally strong salt. A little too strong for some, but at least it was balanced.